The Drop-A-Rock was the first portable rock climbing wall to offer four climbing stations and a realistic climbing surface. It is specifically designed to look and feel like rock without using an abrasive wall surface so that you can accommodate the full range of climbers. Good looks, reliability, and versatility make this the best portable rock climbing wall on the market. The Drop-A-Rock is 100% hand made in the USA to exacting ASTM F24 standards. Each portable climbing wall is tailored to the customer’s specification. The Drop-A-Rock is available in 24 feet, 28 feet, or a towering 32 feet. Our exclusive Auto-Belay system and hydraulic lift ensure that the rock wall is easy to operate. 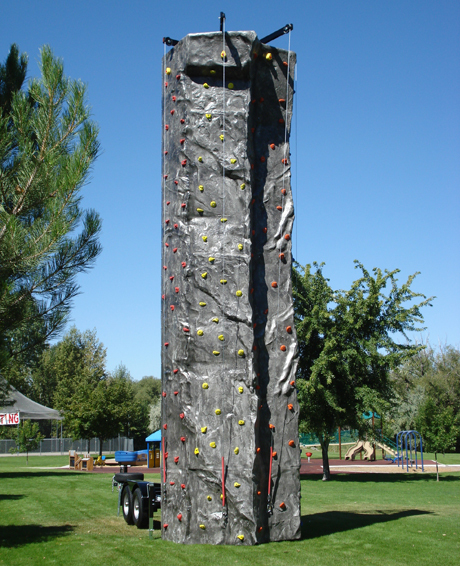 The Drop-A-Rock is the perfect portable rock climbing wall for birthday parties, carnivals or fairs, schools, grand opening events, special promotions, fundraising, team building events, nightclubs, etc.